I love playing board games, but I usually have trouble finding a companion to play with. I like playing long games like Monopoly and Life, and they scare off people! Most of the games I like have been given to me as gifts. Sometimes I call a few of my friends over and we play for a few hours, or when my cousins come to spend the night at my house, we play together. The only games I can convince my parents to play with me are Word games – Boggle being a special favourite since it finishes fast. The word games I’ve got are Pictionary (the senior one), Boggle, Scrabble and Hangman. I like playing Pictionary even though my drawing skills aren’t great. It is a bit tough like once the word on my card was the Wembley Stadium! Hangman is actually called Countdown and is an unknown brand but even then it has given us many hours of pleasure while pouring over its letters. My collection of games is huge but I don’t use some of them because they offer no challenge anymore. But removing them from my library is not an option. I like to build on my collection without breaking it. The ones that continue to hold my attention are: Mad, which is a really funny game; something called Go to the Head of the Class, which is a general knowledge game; Scotland Yard is a detective game; Monopoly Original and Football version, Pictionary, Life, Cluedo and more. All these games require two or more players so they get used less and less. The games that I can play on my own and I like are Kaleidoscope, Solitaire (Brain Vita), and other games mainly by Dr. Woods, a company that makes mentally stimulating games. Although not a board game, I have Mechanix Senior and something called Mechanix Motorized, which is the same thing just that there is a motor given along which you have to attach and the vehicle can move on its own! I also have the usual games like checkers, chess, snakes and ladders, ludo. Even now I do enjoy playing something like Checkers but I have played them all so much that I find them uninspiring. Out of this really long list of games my favourite is Mad. It is really funny. For example, the person who loses all his money first is the winner of the game. If you roll the die with your right hand and you are a righty, you win a thousand dollars, so always roll it with the opposite hand. It is a game that must be owned, so put it on your shopping cart. Currently, my shopping cart contains two games by Dr. Woods that are Railroads and Kogworks. Among the old games, I still don’t own a decent Chinese Checkers and have been longing to own one. Other than these games, I would love to own a Robot that would play any game I want without questioning me. break, we think it was nothing! And then we start our new class. 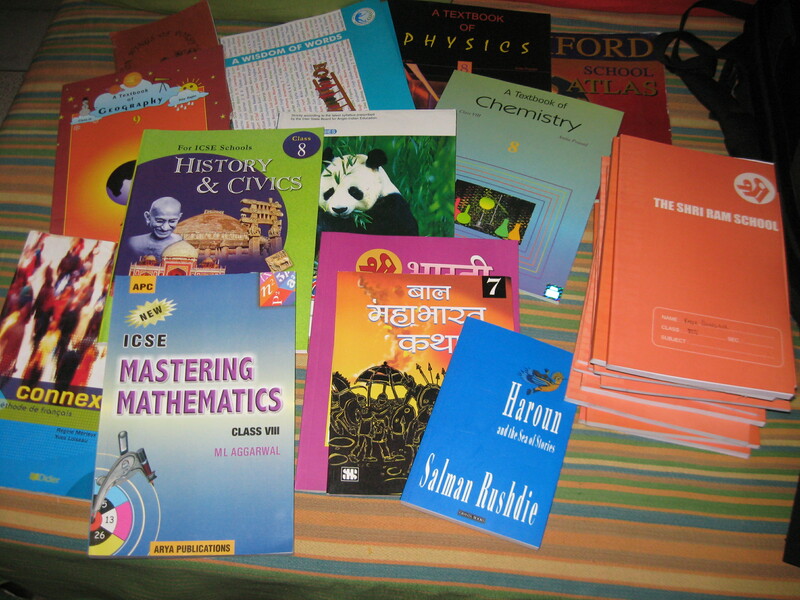 The books for class 8 weighed about 5kgs and I almost collapsed carrying them. The first few days in the class usually feel very different as there is much more work to do. Also, I always have problems writing my class correctly since I am so used to writing the previous class. Our school used to have exams from class 6. But they stopped them till the finals of class 8 and instead kept a weekly test of 40 marks every Wednesday. So this year I would have final exams. I fear that this year would be a lot tougher because of that. But then I just stop and think to myself that there is no turning back now. The next big milestone would be to give my boards. That’s the only thing that really scares me right now. Also, every alternate year we get shuffled – our four sections get jumbled up to form four new sections with different students. In class 6 I had made a great group of friends but we got shuffled in class 7. Now there is going to be a new section ‘E’ so to absorb the new bunch of students, we will get shuffled again! I do hope that I get my friends from class 6 again. After all school can’t just be academics without making lasting friendships. Soccer is the world’s most popular game. Pele once called it ‘The Beautiful Game’ and now that is a known phrase for it. I have been involved with soccer for about five years, and at the moment consider it my favourite game. Soccer is mainly played in two forms, International and Club. I prefer Club because it is more involving and there are many more Club matches then International. Soccer is not much about playing international except for the World Cup which is the most famous tournament held every four years, and countries around the world can play it if they qualify. Brazil is the best in the world cup and I support them. Other International tournaments are the Euro, Copa America, Asia Cup, and African cup. This way almost all countries play some tournament. The most famous of these is the Euro. The Euro is also held once in four years. It was held last in 2008 and Spain won. I am looking forward to the World cup in 2010 where as usual I would support Brazil. In the Euro I supported Netherlands and India in the Asia cup, who won in 2008. All club matches are important these days. All clubs play leagues. The most famous being the English Premiere League. At the moment, on first place is Manchester United whom I want to win. The best players of this season are Nicholas Anelka, Cristiano Ronaldo, Robinho and more. Then comes the best league (according to me), The Spanish Premiere league. I like it because my favorite team plays in it — FC Barcelona. I started liking it because of my favorite player Ronaldinho. He is now in AC Milan which is my favorite Italian club. But I still consider Barcelona as my favorite. They are coming first in their league and have a 12 point lead from the team on second place. Then comes the biggest league for all, The UEFA Champions league. It is the league in which the top five teams of all leagues play together. I am looking forward to the final on 27th May. I play soccer everyday with my friends and the days I can’t go out, I make up by playing Fifa on my PS2 . I play Midfield or Attack positions. My school has a league every year and I have been joining it for the last five years. In the league we play serious football every Sunday. Random teams are made and my past teams have had innovative names like Roaring Rapids, Dynamites, Nokia Nighthawks and Smart Gunners (the best I’ve got). Soccer is like a religion to me. Who is going to worship it with me? These days I have been playing a lot on my Play Station 2. 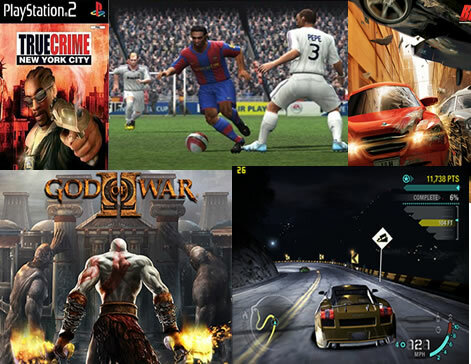 I usually play God of War, True Crime, Fifa, Burnout Revenge/Dominator and Need for Speed Carbon. I do play a few more but these are the ones I like. I like playing all kinds of games, especially sports, fantasy and violent. The games I have mentioned here are almost one of each genre. I’ll only talk a bit about these games. God of War: It’s a game about Greek mythology and has all the Greek gods. It is one of the most violent games in the world and is also rated like that. In the game you are this infamous warrior called Kratos, who is the most powerful person in Greece and has now got the help of the gods to remove all evil. His moves are really cool and the monsters he fights look real. The monsters are Basilisks’ (huge snakes), Hydras’ (huge water snakes), Cyclops’ (one eyed behemoths), Minotaur’s, Wraiths, Centaurs and more. The graphics of the game are amazing as I said everything looks real. I am playing God of War 1 but when I’m done I’ll go for the next 3. True Crime: It’s a violent game and a lot like Grand Theft Auto. Except that you are a cop. You do steal other cars, run over people and then show your badge to stop the cops from shooting you. If you get shot by a cop, you can take his job away. You can buy new clothes, change your hairstyle and even go to hotels to eat. Of course all that costs a lot in New York City and one has to save where possible to buy new guns. One thing better about this game than GTA is that you can walk into any shop or door while in GTA some places are locked. The graphics are really good, like when it’s raining, he gets totally soaked and even his shoes start squeaking. Fifa: It’s considered the best football game in the world. All players and teams are included. Each year all transfers are also made. The graphics are quite good and with the commentary on the side the match looks real. I am now waiting for Fifa 10. Burnout: It’s a good car game even though it’s not quite racing. It’s more about timing, destruction, running from cops etc. It’s a really fast game and that’s the best part about it. Need for Speed Carbon: It’s the greatest racing game I’ve got. The graphics are fantastic. A wide choice of cars. Good story mode, nice places to race and fun to play. I think it’s the game with the best graphics I’ve got. These are the games I play on the PS2. Would be great to know what you think of these games. My parents and I decided to welcome 2009 by counting birds in Bharatpur’s Keoladeo National Park and, once back home, by barbecuing and bonding over hot coals and food. We started our trip to Bharatpur on the foggy morning of 29th December 2008 around 7:15 am. We couldn’t see beyond one or two vehicles ahead of us, and driving his slowest best, my dad decided to stay on the traffic-prone Mehrauli Gurgaon Road instead of taking the new and infrequently used Gurgaon-Faridabad highway. The drive was slow, worrying and, in my case, still full of sleep. As soon as we left behind Haryana and entered Uttar Pradesh, we thought of great paranthas and puris the state was known for, and stopped at a dhaba for breakfast. It was around 9 am but felt very early due to the fog so it felt strange that some people should be eating channas, dal and roti. Instead we decided to celebrate the morning out by having stuffed tandoori paranthas with sweet tea in glasses. The paranthas were delicious with tons of butter on them. I surprised myself by sharing yet another with my father and he by asking for yet another glass of tea (he is a strict coffee drinker). In another hour or so, we reached the temple city Mathura from where we could either take the broken Mathura-Bharatpur road which was only 34 km long or go straight ahead till Fatehpur Sikri and take a wide road to Bharatpur. So, we decided to do the latter and went straight on. The road was reasonable but meant driving for a couple of hours till we reached a railway crossing where we were forced to wait for almost an hour for several trains to pass. The road beyond the crossing got us to Fatehpur Sikri, where about 50 young men alarmed us by crowding around us and insisting that we stopped there, took one of them for Rs100 to see the monuments. It was a sudden attack and almost scary. All of them screamed some rupee amount or other and we played it safe by keeping our doors and windows shut, and moving on to Bharatpur. We were booked at the Birders Inn for two days, and made our entrance there somewhat late in the day at 3 pm but the rest was cool as the restaurant’s club sandwiches and paneer pakodas helped forget the delay. After about 15 minutes of eating, our guide Brijendra Singh arrived to take us for a walk to the park. We were told that he was one of the experienced guides of the Park. Quite soon we agreed that he was one of the best because he was carrying a spotting scope which he was very quickly able to focus onto birds. He took us to the part of the park we hadn’t seen before and made us understand the characteristics of various water birds. Not only that, he often tested us on the new knowledge he was giving us. Birding through the scope was very much more fun as one didn’t just see the form clearly, one also saw the shiny eyebrow of Common Teal, the colorful beak of the Spot-Billed Duck and the raised beak of Comb Duck. We wound up the evening by sitting around a bonfire with the other hotel guests, having a buffet dinner and crashing for the day. The next day also started with a heavy fog that ended up delaying our bird watching. I was excited about the experience of birding that day because we had decided that I would bike around on a hired cycle while my parents and the guide would walk. Our guide got me a well sized atlas cycle that surprisingly ran quite smooth. I used to zoom ahead and then cycle back to join my folks. Birding this way proved to be fun. We started with some forest birds in the form of Grey Nightjar, Orange-headed Thrush and a Red-throated Flycatcher. We moved to the water birds that were many and the walk for my parents was quite long. So long that we stayed in the sanctuary for 8 hours and towards the end my Mom would just sit some place or another when she couldn’t stand it anymore (pun intended!). Although I didn’t note down the bird names, I became aware of a lot of new names and I believe our species count was 80+. We returned too late for lunch so had a snack of grilled chicken sandwiches, more pakodas and fresh lime soda at the next door Hotel Sunbird. We ended this day too by enjoying the bonfire before and after our dinner. The next day we found ourselves at Fatehpur Sikri but this time we were prepared for the guides. We took on a guide who was less aggressive than the rest and didn’t appear to fleece us. After a 10 minute uphill walk he took us inside that part of Fatehpur Sikri that had Saint Salim Chishti’s tomb and a few impressive gates. This whole area was full of people and looked very dirty. I was glad I had kept my socks on. Soon I was glad to be out of it and into the nicer part of Sikri that was controlled by ASI and had the known monuments that I had read about just this year. There were Diwan-i-Aam, Diwan-i-Khas, Panch Mahal and other well kept buildings on a wide stretch of sandstone platform. There were also well maintained gardens that came as a surprise. We left for Delhi around 1:30pm, took a shorter route, tried the Faridabad road for the first time and made it to Gurgaon by 5 pm. We quickly did our shopping for the New Year eve barbeque, and I even managed to play soccer with my friends for an hour before settling down to light the fire and celebrate the beginning of 2009 over juicy kebabs and Snapple. It was a tiring but satisfying way to invite the New Year. Here are some pictures I took to record these two days. Recently, I saw my Dad collected and taking pictures of some funny sign he came across. I decided to do the same. Till now I have got only two but I will keep my eyes open for more. The first one says ‘Always Wear A Helmet While Driving.’ I didn’t quite get whether one should wear a helmet while driving a car too. Both images seem to be “Powered by Su-Kam”. I will continue taking more of these funny pictures and show them to you. 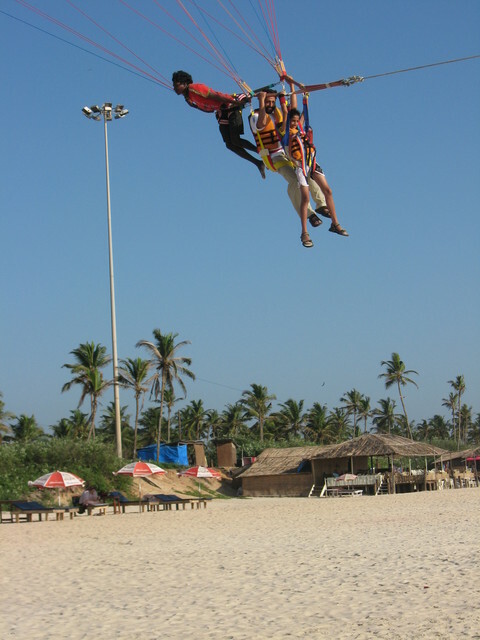 When we reached Baga in Goa, and saw the beaches, the main thing that happened on the beaches were the water sports. There was a Water Scooter which went really fast and was really bumpy. 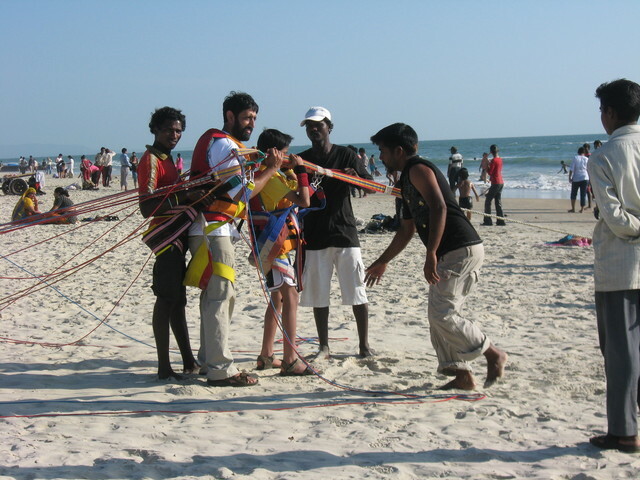 Then there was a Boat Ride and of course the Para Sailing. At first I thought it was really scary and that I wanted to stay away from it. So when we left Baga, the next beach place we went to was called Sernabetam. We just happened to go to the beach on the first day. On this beach there were even more people going for water sports. I wasn’t at all prepared for this, I was being forced to go Para Sailing. People were telling me I would want to go again if I went. And my Dad told me I wouldn’t be allowed to. So I thought I may as well just experience it and see for myself. I was very scared. I went with my Dad. They hooked me and then the boat we were tied to, took off. We were airborne, for a moment I thought I would fall down, but then I thought, why would people make this sport and why is it so popular if people fall down. Then I was actually enjoying myself. For about 7 seconds I enjoyed it and then we came down. It was so short, only 20 seconds, and they charged 500 rupees. They were right, I did feel like going again (still do). It was really a lot of fun. 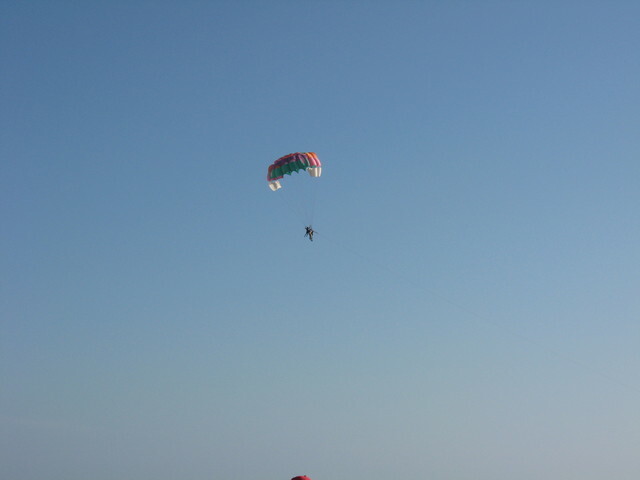 So I learnt, that one should always try new things otherwise I would always have had a negative point on Parasailing. But there is one thing you have to agree with, that is that the water scooter is dangerous! PS: Photos taken by Mom. Confusion in the DTC bus stop, sorry, Delhi airport. Many first time flyers that are completely clueless and are wondering what’s going on. Seriously it looks like a bus stop. 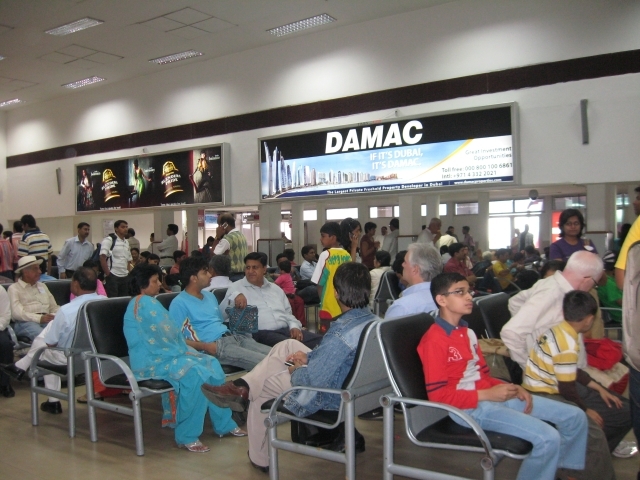 So many people, all seats occupied, so much of noise, I have never seen this in any airport before. This place really feels like a future bus stop. Me as in Kabir Bhargava who is 11 years old.I study in the Shri Ram School Aravali which is in Gurgaon DLF Phase 4. I live in messy Gurgaon but inÂ a quiet, good andÂ clean place called Green Woods City (Sector 46). I love Soccer, it is my favourite sport too. I am also pretty good at it. In food, I love all sorts of junk food (Pizzas, Burgers, Hot Dogs, Salami Sandwiches and other sandwiches andÂ all sorts of chips, and lots of other yummy junkfood). But I do not eat all that so often,Â because I have to eat healthy food which I do not like and consider it a waste of time. I also likeÂ Italian food and Chinese food. Thats all about Me, Myself and I. Watch this space about other things that are awesome.